Pictured on the right is a cluster of ripe fruit in late March, produced from January flowers, on a grafted Big Jim loquat tree. This tree has been in the ground for 4 years and this is the first time it has fruited. It is located on the east side of a large pine tree, very close to the larger trees dripline, so it is in the shade in the afternoon. The flavor of the fruit is peach like with a sprightly tang. It reminds me of the flavor of the Mango Melon Starburst Fruit Chews. This tree was planted in February and has more than doubled in size since then. Loquats grow in the lower desert if they receive some protection from the afternoon sun and adequate water. Their large exotic looking foliage is very attractive and select varieties produce delicious fruit. Freezing is not a problem anywhere in the lower and upper Sonoran desert. The most challenging aspect of growing loquats is their sensitivity to salty soil, and specific nutrient deficiencies (detailed below). Loquats come in many varieties with fruit varying in size, color, and flavor. Big Jim fruit, shown on the right, has one of the largest fruits and offers a very good flesh to seed ratio. 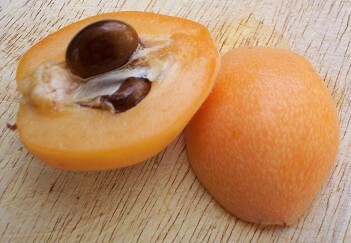 Loquat seeds are large, black, and smooth and easily separated from the rest of the fruit. The skin on the fruit is fuzzy like a peach but is not palatable. The easiest way to eat a fresh loquat is to slice it open with a knife, discard the seeds, and then eat the flesh off of the back of the skin, similar to how a kiwi is eaten. Loquats grow easily from seed but seedlings have a very low probability of producing good tasting fruit and might not even fruit at all. Therefore, it is strongly recommended that only a grafted tree be purchased. Grafts are sold as named varieties and the graft point should be clearly evident near the base of the tree. Loquats need protection from afternoon sun in the lower desert. Exposure to direct sun at temperatures over 100 degrees will scald the plants leaves and eventually kill it. Newly planted trees should be protected from late morning sun their first summer using a shade structure. After the first year, loquats do well in Eastern exposure and filtered sun. Care should be taken to choose a loquat variety that fruits during the mild months of the year so that fruit is not lost to summer heat. Big Jim fruits are a good fit to the lower desert because they are ripe in May. Loquats are evergreen, but freezing is not a problem in the Sonoran desert because loquat foliage is hardy to 20 degrees Fahrenheit. Fruit and flowers are less hardy so it is best to choose a variety of loquat that flowers after the possibility of frost is past. Loquats do well on a grass watering schedule. 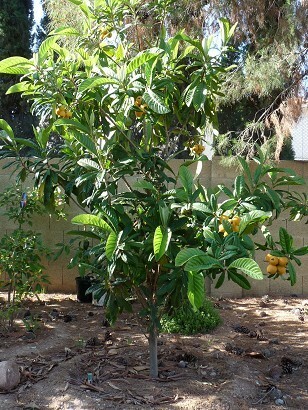 Newly planted loquats need extra watering the first summer if their leaves get exceptionally droopy. Loquats are very sensitive to soil salinity. Since Phoenix area water is already high in salts, the safest thing to do is to not use any chemical nitrogen fertilizers. Soil amendments such as compost are still beneficial, as are mild organic fertilizers such as fish emulsion 0-10-10. Loquats exhibit some very specific nutrient deficiencies in the Phoenix area, which are often mistaken as fireblight or salt burn. These deficiencies are most likely due to the soil alkalinity here. The problem first shows itself by causing older leaves to dry up, starting at the edges and then falling off, and it will progress over most of the tree. Loquats will exhibit this behavior for years and it greatly slows their growth and can eventually kill them. I lost my first loquat to this problem. To understand this problem, one must first realize that it is not fireblight. Phoenix is just too dry for fireblight. The second thing to realize is that it is not salt burn because salt burn distributes itself evenly over the tree, instead of going after older leaves first. The pattern of the burning is suggestive of magnesium deficiency, and this appears to be what it is. I have stopped this problem dead in its tracks and restored tree vigor by a single application of a three fingered pinch of magnesium sulfate diluted in a gallon of water. I pour this mixture on the ground around drip line of the tree about once a month during the warm and hot months, but not during winter. I have also had issues with my tree having burning on the new leaves which was not helped by adding manganese. New growth was very slow and the emerging leaves quickly burned before they could reach a good size. The tree as a whole was also not as dark green as normal. I believe this is a type of chlorosis, due to iron deficiency, or manganese deficiency. It seems that loquats by nature will never really display yellow leaves. The leaves instead range from very dark green to light green so chlorosis is harder to spot on this tree. I have found that manganese sulfate fixed this problem. I apply it the same way I apply magnesium sulfate by mixing it in a gallon of water and pouring it around the dripline. Burning of older leaves can also suggest a potassium deficiency although the pattern is different than what appears on the loquat. To be safe, I also give the tree a small dose of Alaska fish emulsion 0-10-10, also diluted in water and poured around the drip line as per. the directions. Some other organic source of potassium will probably also work well. The potassium treatment is most likely only needed once or twice a year. Other than the specific elements magnesium, manganese, and potassium a loquat does not seem to need much of anything else in the Phoenix area. My tree grows steadily with no nitrogen supplement at all. Keep in mind, that loquats are sensitive to salinity so adding any unecessary elements to the soil is risky. Loquats can be grown from seed, but good fruit will only be reliable on grafts. Birds love loquats and can get all of the fruit unless measures are taken to discourage them. Attaching shiny foil colored helium children's balloons to the tree, when the fruits start to turn color, is very effective. Leave some cord attached to the balloon so it moves around unpredictably. These type of balloons are also thick skinned so they won't pop easily like standard rubber balloons. Covering the tree with a net also works but will break the branches on young trees, so this is only recommended for larger trees. Loquats are also susceptible to fire blight, a disease that affects roses, but this doesn't appear to be a problem in Arizona's dry climate.